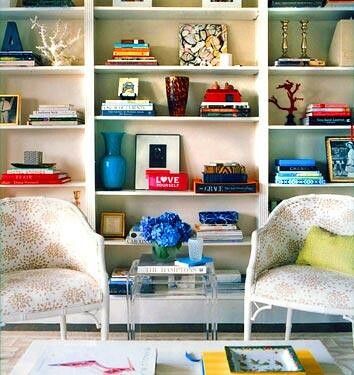 Colorful bookcase display + white living room, upload feito originalmente por xJavierx. Designer Annsley McAleer's Boston home, featured in Domino. She discovered the chairs at an antique mall in Connecticut; she painted them and covered them in a fun print from Hinson Fabrics. The bookcases take up the entire wall of the room. Photo by Justin Bernhaut, Domino, April 2007.